I had another order for the strawberry and white chocolate gateau, this time for a pair of twins who were celebrating their 10th birthday. 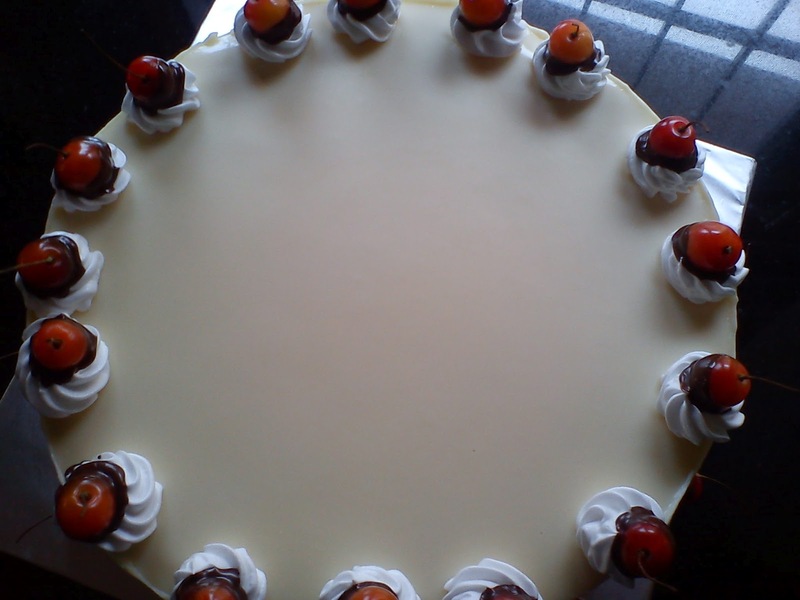 And instead of strawberries to decorate the top with, I dipped fresh cherries into melted chocolate for a different look. There are some 6 layers to this gateau. 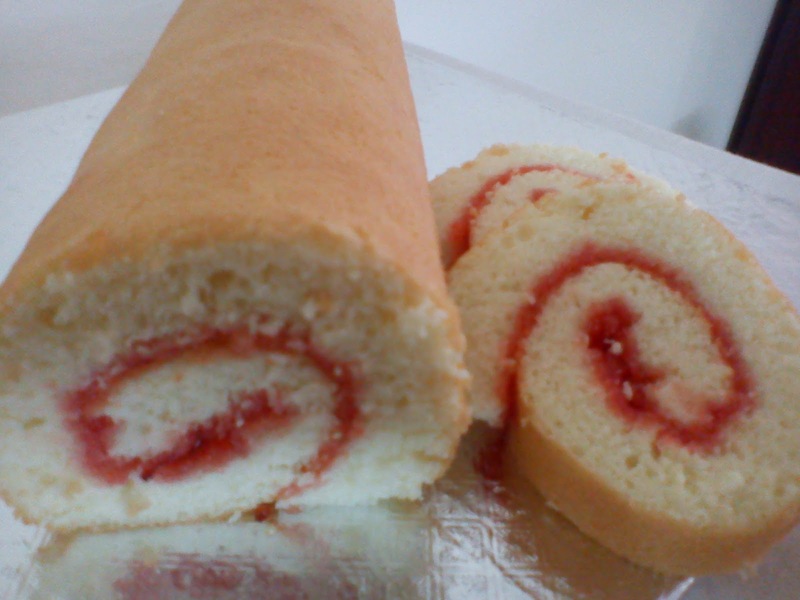 Slices of Swiss roll, also known as jelly roll, are arranged along the outer edge of the gateau. 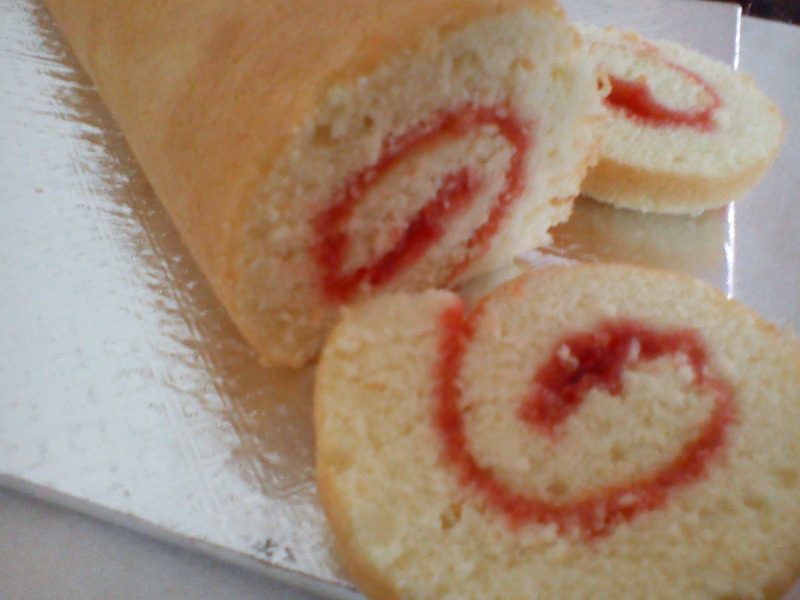 Swiss rolls are easy to make but a challenge to a lot of folks, mainly because they have a tendency to crack whilst being rolled up. As with most sponge cakes, this roll needs only a few ingredients and no oil or butter in the batter. 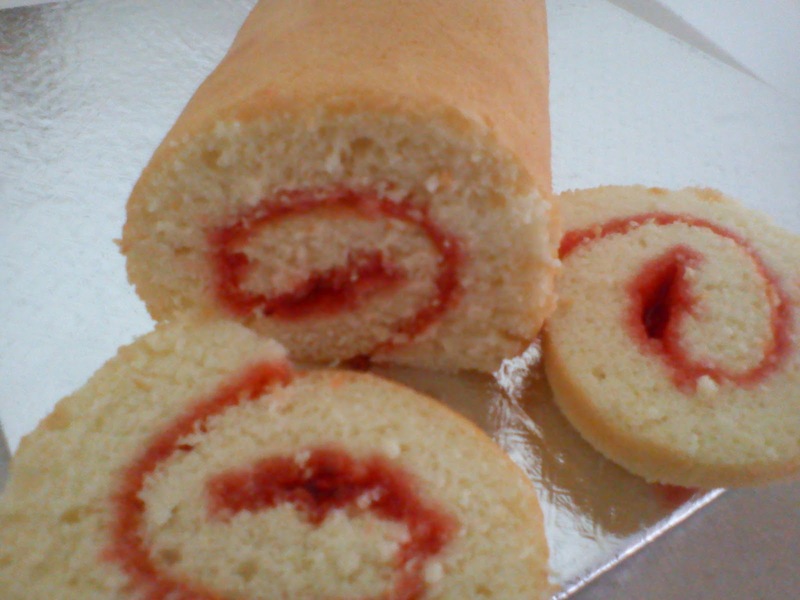 Here's the recipe for a supple Swiss roll. Sift the flour three times. Place sugar and break the eggs into a mixing bowl. Also add in the vanilla essence. Use an electric beater and beat till very thick and fluffy. Fold in the boiling water, then fold in the flour in three lots. Fold in gently so as not to knock out the air. Use a spatula to scrape the batter into the prepared tin. Spread the batter into the edges of the pan and level the surface. Drop the pan onto the counter top to knock out the larger air bubbles, place in a preheated 190°C oven for about 13-15 minutes. While the roll is baking, cut a sheet of greaseproof paper that is a little larger that the baking pan. Dampen a kitchen towel, then place the greaseproof paper over it and sprinkle some sugar over. 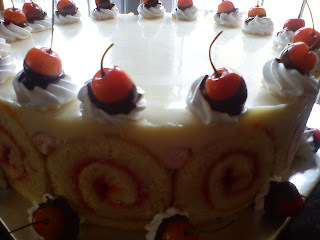 When the cake is done, it should be firm to the touch and would have shrunk a little from the sides. Take the pan out of the oven and turn it over onto the sugared paper, peel off the lining paper and discard. Roll the sponge in the kitchen towel and keep aside for about 30 minutes. When the roll is cool, remove the wrappings, sprinkle sugar or icing sugar over the roll. Use a sharp knife and a sawing motion to slice. And why was sugar sprinkled on the sheet of greaseproof paper? It was to prevent the surface of the roll from sticking to the paper.